June just started, and it’s time to talk about the best shopping deals for June and July. The retail cycle is very predictable, so it’s easy to save money on specific things. It’s also smart to buy produce that is in season, it tastes better, and is cheapest when it is most plentiful. With Father’s Day approaching, watch for tools to be on sale. In the same vein, home improvement supplies are likely to be on sale. Look for deals on paint and painting supplies. Many retailers will sell you untinted paint and you can go back and get it tinted later when you are ready to paint. Televisions will be marked down to make room for new models. Gym memberships can be negotiated now. There are fewer signups so gyms might discount their pricing to entice you. Dishware, it is wedding season, and dishes are a traditional gift. No weddings to go to? Maybe it’s time to finally replace some broken pieces or treat yourself to new plates! Lingerie will be on sale thanks to the semi-annual sales at many stores. Also, Gold Toe socks are often on sale in June. After the 4th, watch for grills to go on sale. Swimwear is most plentiful now, so while it might not be the best price, there is a better selection in July, same with shorts and summer footwear. Air conditioners are an unexpected sale item in July, it might be a great time to think about an upgrade. School supplies like printer paper, notebooks, and writing instruments will go on sale in late July, so stock up for the next school year. Furniture and other home décor will go on sale in July to make room for new items in showrooms. Since all the major jewelry gifting holidays are over, there will be sales on fine jewelry, especially at online retailers. Airline tickets for later in the summer and cruise prices will drop in July. And my personal favorite is Amazon Prime Day, a kind of Black Friday Sale in mid-July. It’s a 30-hour day of special pricing only for existing Prime members, so it’s a great time to start your free trial if you aren’t already a Prime shopper. Butter production is high in June and July, and it freezes well. Stock up so you have plenty to last through summer and into the fall baking season. June is Dairy Month, so milk, cheese, and other dairy items will be promoted at lower prices. Champagne and other sparkling wines are often on sale for wedding season, here is a post with some great choices that are already well-priced. 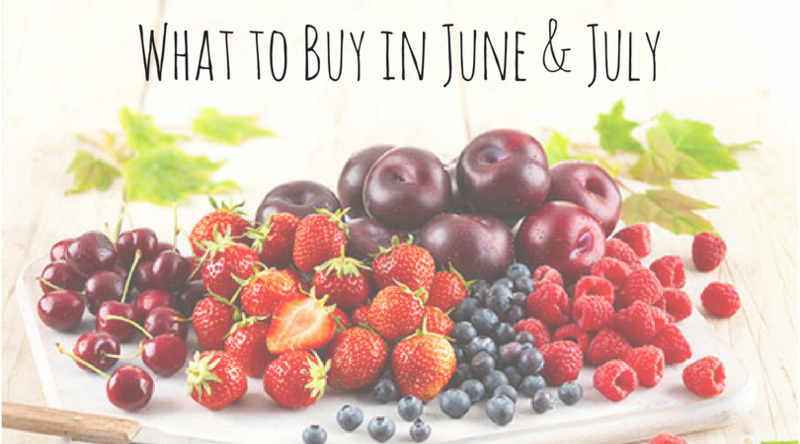 Summer fruits are going to be at their peak of flavor and availability, here is a list of the best choices for June and July: Apricots, berries of all types, cherries, grapes, mangos, melons, peaches, and plums. Summer vegetable choices include: Beans (especially green beans), beets, corn, cucumbers, okra, peppers of all kinds, summer squashes (the kind with soft skins), and tomatoes. Here is a link to a great printable chart of seasonal fruits and vegetables. Here at BillCutterz, we save money for our clients all year round by lowering their monthly bills. It only takes a few minutes to sign up, and then you can sit back while we do the work!